To block websites on your home computer without spending lots of money in expensive software, here’s a trick for Windows PC. Step 2: Don’t panic if you see some weired characters when notepad opens up. Simply goto the last line of the file and stat typing the websites that you want to block, each seperated by a line break (ENTER). Save the file, exit and you’re done. 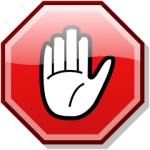 No one will be able to access those sites that you have just blocked using this method. The good thing is you can keep on listing as many offensive sites you want to be blocked. If you want to remove the ban later, open the same file as mentioned in Step 1 and delete the above lines. hi,i’ve tried blocking youporn.com but it still shows up when my son opens it. thanks a lot but is there a way to block the entire website including all its subdirectories without showing messages like access denied or enter password to get access. I mean the same way HOSTs file work, unable to connect. hey ive edited the file but without www. and saved it. now i cannot access to the same file from c:\WINDOWS\system32\drivers\etc\hosts it is saying access denied. Do this task by administrator login you must be using user login account that the reason this massage is appearing, or your system administrator restricted for access. How to block all site except gmail ? Kenan, you might want to read the comments in this post http://www.davidtan.org/simple-trick-to-block-websites-in-windows/ , hope that helps. this is dumb! why can’t i block facebook.com? Yes, you can block whatever website you want to. 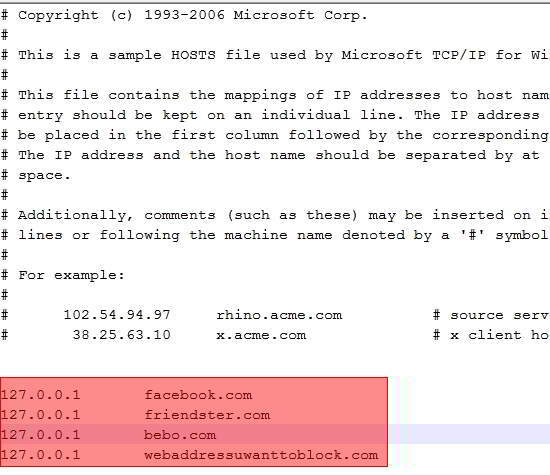 Are other websites (listed in hosts) blocked successfully and is it only facebook.com that can’t be blocked? but it can be access by using some websites unblocker………. do you have any solution for this thanks.! I would like to know what do you mean by “websites unblocker”. Do you have an example? A web proxy hosted by someone on the internet or some kind of software? If it’s a web proxy, I can see why it’s still accessible and that, I’m afraid, can’t be blocked by using the method mentioned in this article. If it’s a software installed locally on a computer, then *maybe*, there’s still a way around it. Thank you – this is excellent! it should, did you follow through? any errors message? seriously? did u save it to the right place? One problem… I can’t seem to save the file. I hit save and a sort of error message pops up and says “can not save the file. Make sure the path and file name are correct. Then a window pops up letting me save it as a regular file somewhere on my computer. I did that, and the sites were still working. Any help? Your question has already been answered. Please read through the comments. what is a net gear? could u tell me how to block sites of entire network? we have ZTE zxdsl 831 II series router..
You are not administrator account holder .. thats why that message. Very good content thanks for posting. I will deffinately come back here again shortly. I did as you said but when I try to save it saves in text file. seems like it has protection on the file to modify or change. My os is Win 7. how can I get it saved? it should work regardless of which browser you’re using. Have you tried other browsers such as internet explorer, firefox, opera or safari? i can’t block facebook website.grrrrrrrrrrr! Thanks! Now facebook is blocked from my computer. That can’t be true, it should work on any browsers. Thanks for the great information. When I get home from work I am going to try this on all of our computers. How would I blook facebook from an IPAD? Good question. I haven’t tried doing this on iPad but I’ll find out soon, stay tune. Please help, i have about 20 computers on my net work, i want to block all unwanted websites i.e facebook, youtube, redtube etc etc, i have linksys router on which i’ve blocked some sites but can’t do them all. I am using RedHat Enterprise Linuc 5 server, don’t have no ISA set up at the moment, what can i do to block all the unwanted websites on my user computers??? one more question is it possible to block 15 computers only on my network not the entire 20 computers? Please HELP…. I tryed but is not working? Any ideas why, I did it exactly how is described. hi it works well but the sites i blocked can still be accessed via google cache. Good point there. I haven’t actually thought about that before. Do you know what’s the url of google cache for the website you’re trying to block? Let me know and I’ll see if i can spot a pattern. Have you thought of updating this post to include solutions provided by the comments? I can update it if i know what’s left out in the post. Do you mean the UAC part or…?